UAV technology is moving apace – to the benefit of all sectors, including energy and LNG in particular. The UAV (Unmanned Aerial Vehicle) inspection and survey methodology has revolutionised monitoring and inspection regimes and planning by providing high-quality data across all operations. Such data removes uncertainty and risk for LNG producers who are naturally focused at all times on plant availability and the avoidance of any potential disruption to production as they work to meet the conditions of highly demanding supply contracts. Time-consuming manual access solutions are obviated by UAV inspections, which, critically, remove the need for plant shutdowns and allow assets to be inspected while they are live. Time and cost savings are achieved as well as numerous operational benefits such as improved monitoring and planning. Safety is also improved as personnel are removed from areas of potential danger. What are the applications of UAV technology? Most people immediately think of close visual inspection (CVI) when they think of UAV or drone technology. CVI generates thousands of images and high-definition video of an asset, providing data to inform engineering decisions in a fraction of the time that it would take a large manual access team. The level of detail achieved by onboard cameras is extraordinary and extends to the tiniest cracks and defects on an asset, which are all captured by the onboard cameras. Footage can be reviewed, slowed down, and replayed to analyse and identify problem areas, common difficulties, or regular maintenance requirements. Getting the most out of UAV technology is all about tapping into the applications and reporting functionality. UAV inspection service companies should be anticipating the needs of LNG producers and helping them to achieve ever more outcomes as part of their maintenance and planning regimes, bringing greater versatility and problem-solving applications to bear. 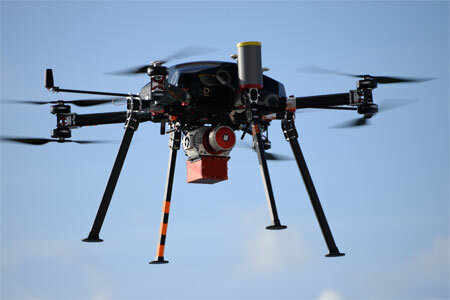 Texo DSI UAV integrated Survey-Grade LiDAR system. Today’s UAV applications involve the use of multiple UAV platforms with dual payloads and cameras/sensors that use a variety of high-quality, factor calibrated and interchangeable lenses that are tailored to meet varying requirements. Visual and thermal analysis can be carried out simultaneously in one inspection or survey, covering everything from coupled structural thermal analysis to hot spot identification, leak detection, and water ingress detection. Advanced flight control and the latest software systems allow for highly detailed orthomosaics to be stitched together seamlessly; this gives a complete and highly detailed overview of the specified target area. The applications go way beyond CVI and include thermography, thermal gas detection, optical gas imaging and hyperspectral investigations of structures, LiDAR surveys, and precise information modelling. Thermographic survey applications provide benefits such as more accurate coupled structural thermal analysis, leak detection, water ingress detection and hot spot identification. Infrared cameras can track down gas leaks before a problem occurs and an asset needs to be shut down. Optical Gas Imaging (OGI) comes into its own for regular inspections of connections – and there can be thousands of connections on a particular asset. The trouble is that only a small percentage (probably around the 1% mark) of these components will have a leak; OGI can quickly detect and locate leaks accurately and without the need for shutdowns and ‘sniffer’ testing. OGI cameras are effective even at a distance of many metres and can scan a much wider area, as well as allowing operators to look into hard-to-access places. Hyperspectral imaging (HSI), or imaging spectroscopy, is a technique that combines imaging and spectroscopy to survey a scene and extract detailed information. It is an intensive data-processing method that creates a ‘data cube’, which contains information about the properties of a target at hundreds to thousands of narrow wavelength bands. The obtained spectra are then contrasted with known, unique spectral fingerprints (e.g. for asbestos) to detect, characterise and identify chemical compositions, materials, liquids, or events. The really big benefit here is that all of this can be referenced to a precise location in a scene – whether it is on a pipeline or a flare stack. Corrosion is an ever-present problem for all process plants, and again UAV inspection applications are at the forefront of combatting it, providing highly accurate measurements of remaining wall thickness regardless of any coatings present. Texo DSI has recently developed a world-first integrated ultrasound thickness (UT) UAV system that can deliver a number of measurement applications and provide precise measurements on flat and curved surfaces. Inspection data is combined with a precise photogrammetric visual overlay of the completed survey, pinpointing exact measurement locations on the structure/surface to an accuracy of sub 10 mm. Accuracy is matched by speed: Such inspections are 20 times faster to complete than traditional access and measurement methods. Alternating current field measurement (ACFM), an electromagnetic technique used to detect surface breaking cracks in metallic components and welds, is also soon to be delivered by Texo DSI. 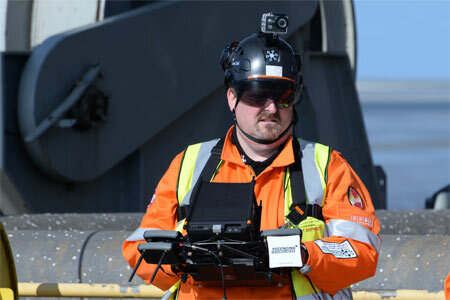 UAV applications excel in internal inspection within confined spaces. Manual access in confined, unlit, and hazardous spaces is a major logistical and safety problem for plant engineers, with attendant time and cost implications. Time taken in dealing with complex logistical issues can mean that inspection times are squeezed – something that can lead potentially to lesser faults being overlooked or missed, which could ultimately lead to failures in systems. Using an internal UAV can resolve all of these issues and get results quickly. The internal inspection system configuration on Texo’s internal UAV allows for detail of 0.2 mm per pixel to be attained for engineers, while its rapid deployment and manoeuvrability allow for tanks and other vessel structures as small as a diameter of 6 m by a height of 25 m to be inspected thoroughly – and in as little as 30 minutes. A carbon fibre anti-collision encapsulation system enables the UAV to come into direct contact with surfaces to maximise data quality while at the same time safeguarding against any possible damage to the asset or the UAV. In areas of signal interference, and to maximise operational deployment, Texo also uses its own customised, ground based, mini, all-terrain, mobile antenna deployment vehicle; this makes it possible to carry an extended antenna relay system into the base of large tanks and other vessels. The mobile deployment system is combined with a visual, infrared and image intensifier camera (night vision) to allow the rover to monitor the drone if required. Investment is driving ever greater accuracy across all UAV operations, and LiDAR survey work is a prime example. UAV survey and inspection technology offers huge advantages in every part of the LNG lifecycle – from site exploration to production. David Williams, Principal Operations Officer, Texo DSI. Traditional ground-based surveys typically take ten times longer to carry out than a LiDAR survey – worse still, they come without the added benefit of high-definition images of the site or structure. Advantages of LiDAR over traditional surveying methods include: Dramatic cost savings; step improvement in safety; faster turnaround and improved site information to aid decision-making. As with so many UAV applications, it is the scale and accuracy of LiDAR that differentiate it and raise it above conventional survey methods. UAV surveys can cover hundreds of hectares in a single day and acquire thousands of high-definition geo-referenced aerial photographs. The principle of LiDAR is to measure distances via light in a pulsed laser form and record the time it takes from its generation and subsequent return to calculate distances. The images are then processed to provide highly detailed aerial mapping and topographic surveys. In a typical UAV LiDAR survey, accuracy of data is generally to around 40 mm; however, substantial investment and development of its LiDAR UAV fleet and associated survey software has led to Texo DSI Ltd achieving accuracy of 1 – 3 mm with its survey grade UAV integrated LiDAR system, which is delivered via a custom-built UAV platform that measures over 1 million points per second. This degree of precision means that surveys of assets can achieve pinpoint accuracy, acting as highly reliable baselines for future surveys. The technology also brings with it the ability to conduct long range (BVLOS) surveys, via Texo’s HEF 32 UHS (Unmanned Helicopter System). This survey technology is invaluable in the design of the layout of a site, planning construction works and getting an understanding of the geology of the area. It is particularly useful in getting work done when daylight hours are short, a factor that makes speed a premium as well as accuracy – with outputs that include orthographic images and a visual elevation model of the site. UAV surveys often uncover extra information that can be critical; for example, a hidden culvert running through a site, which would not be so easily seen, or even recognised at all, on a land survey using traditional methods. They are also used for locating trees and vegetation, bodies of water and existing roads and infrastructure, as well as for carrying out wildlife counts and mapping of the ecosystem, which are crucial in the development of environmental impact assessments. UAV technology has a major impact on maintenance and monitoring as well as planning: It provides information that would be much more difficult and costly to acquire in any other way. Above all, UAV technology is about improving operational integrity for LNG producers. The depth of data, coupled with clear analysis, removes doubt and uncertainty, and ensures that decision-making is based on the very latest, as well as the very best information. New applications are constantly being developed to improve operations across the LNG industry: As in everything, the focus is firmly on providing commercial advantage for producers.